Flowers are always associated with beauty and love. Many people gift flowers to their other half from time to time, on special occasions or just as a sweet surprise. One of the things that is more precious than the gesture of flowers is time. And last weekend, A Better Florist gave us the perfect opportunity to enjoy the gift of both. Each workshop is unique as it features different flower combinations. For our class, the main type of flowers we got to work with are Roses, Carnations and Baby's Breath. The first step was to clean up the flowers. Good idea to get rid of the thorns on the roses before doing anything else. The Carnations required some 'massaging' to aid it in blooming. We also had to remove the leaves on the lower parts of the stem as we did not need them there for a bouquet. Next, we moved on to the hard part: Arrangement. A demo was done for us by the teacher to show us the final product. No one could quite remember all the steps, but it was fine as he guided us along the way. If we had one thing throughout the class, it was confidence. We thought we had a good finished product several times, only to get a chuckle from the teacher when he sees our work. And after rounds of guidance, we finally had our finished bouquet! We saw a video where Photographer Emily Quinton took many different photos from just one bouquet. So we decided we have to give it a try too! We didn't reach a hundred, but here it goes. In the end, a two hours workshop gave us an entire weekend of fun. Nothing beats trying something for the first time together with your loved ones. Really appreciate A Better Florist for the invitation as we enjoyed ourselves during the workshop. 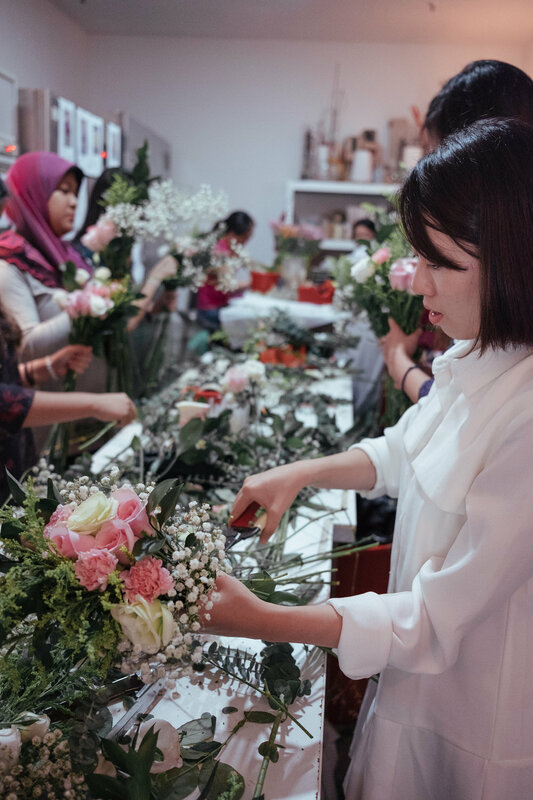 We both truly feel that this workshop could be a wonderful gift to your other half, as you get a bouquet of flowers at the end, and more importantly, you get to spend a great time with him/her. P.s Flowers are still looking good after six days! Details on which flowers will be used is available at the sign-up page of each workshop. Feel free to bring back leftovers for other uses such as flat lay photography. Be careful while dealing with the roses as it's easy to get pricked. Plant food is given at the end of the class.